Aerial view of a neighborhood destroyed by the Mocoa Debris Flow on 31st March 2019. REUTERS/Jaime Saldarriaga, via The Atlantic. An annotated aerial photograph showing the multiple small landslides and the main track of the Mocoa Debris Flow in 2017. Image from García-Delgado et al. (2019). 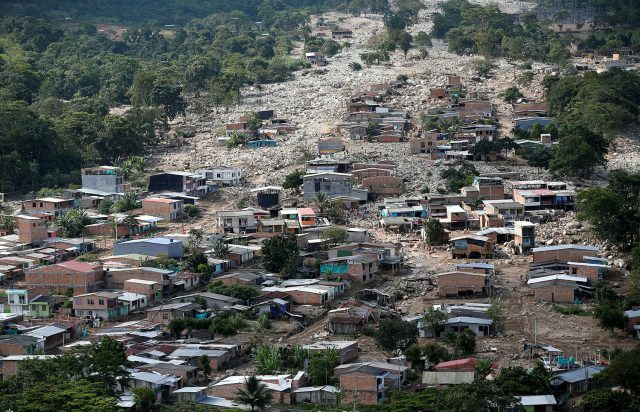 In total they identified 629 smaller landslides that contributed to the Mocoa Debris Flow, which had a volume of about 3.5 million cubic metres. A key factor in the level of loss was that the town had expanded in recent years towards the west, with many newer residences being built on fan deposits, built up during previous debris flows. Without mitigation measures, this is a high risk recipe. The events of the Mocoa Debris Flow were triggered by a three-hour rainfall event in which about 130 mm of precipitation fell. At the time of the Mocoa Debris Flow pore water pressures were already high as a result of previous seasonal rainfall. The final factor in the disaster may have been choking of the channels upstream of Mocoa, which allowed larger masses of debris to accumulate and then be released. Overall, the Mocoa Debris Flow disaster is a salient lesson in the need to manage catchments (García-Delgado et al. 2019 suggest that farming and deforestation may have contributed to the slope instability) and to ensuring that communities do not live on debris flow deposits. As the most intense rainfall events become more common as a result of climate change, the risks from these events are increasing.